When South Korea released its inaugural Chiwoo Cheonwang series of silver bullion medals in 2016, it was met with worldwide acclaim. It was so popular that a year later its entire mintage completely sold out. In 2018, South Korea released its third entry in the series – and for the first time ever, has released a special two-ounce silver coin with an incuse design! An incuse design means the details are sunk below the surface of the coin. Most coins feature designs that rise from the surface. It’s a unique design technique not often attempted, but when done successfully – like on this 2018 South Korea Chiwoo Cheonwang Two-Ounce Silver Incuse Medal – it creates a superb contrast that you won’t want to miss! South Korea really upped its game on the design of this two-ounce, 99.9% fine silver piece. While previous years showed Chiwoo Cheonwang in beautiful detail, they can’t compare to the exciting image on this year’s medal. Chiwoo Cheonwang is shown in vivid detail on the back of his warhorse, his battle sword extended in his right hand driving forward as if he’s going to slash an enemy lurking behind you. His battle helmet also for the first time reveals a portion of his face, a visage frozen in the frenzy of battle as he charges forward to victory. The legendary warrior upon which this design is based on is regarded as the symbol of victory in Korea. In Korean mythology, Chiwoo Cheonwang is honored and worshiped as the “God of War.” In battle, he wore a demonic mask that obscured his face and terrified his enemies. Combined with his ability to cast magic spells and control the weather, Chiwoo Cheonwang fought a series of epic battles against China’s Yellow Emperor more than 4,500 years ago. Today his mask serves as the mascot for South Korea’s national soccer team, the Red Devils. To assure you’re victorious in obtaining one of these beauties, add the 2018 South Korea Chiwoo Cheonwang Two-Ounce Silver Incuse Medal to your cart today! NEW DESIGN IN POPULAR ONGOING SERIES – For the first time ever, the Chiwoo Cheonwang series features an incuse design. Struck into the surface of this two-ounce silver medal is the face of South Korea’s legendary warrior not obscured by a battle mask. The obverse shows the image of Dokkaebi, a supernatural goblin that, despite its grotesque appearance, is a symbol of good luck. STRUCK IN PURE SILVER – The 2018 South Korea Chiwoo Cheonwang Silver Medal is struck in two ounces of 99.9% silver. 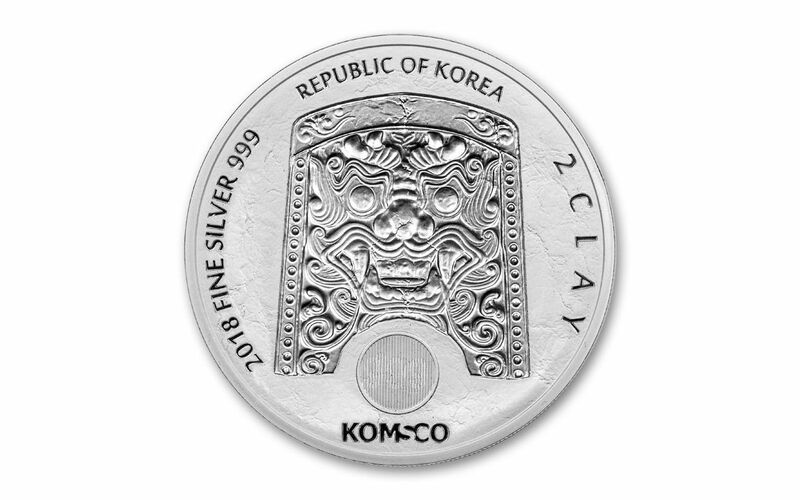 UNIQUE MONETARY DENOMINATION – Each 2018 South Korea Chiwoo Cheonwang Two-Ounce Silver Medal bears a denomination of 2 Clay. While not legal tender, this is a new concept of measurement value for South Korea’s bullion releases. BEAUTIFUL GEM BRILLIANT UNCIRCULATED CONDITION – Your 2018 South Korea Chiwoo Cheonwang Two-Ounce Silver Medal comes in beautiful Brilliant Uncirculated (BU) condition, which means that your coin is the product of a superb strike that places it firmly among the elite of the run! UNIQUE SECURITY FEATURE – Each coin in this release also features a unique security features integrated into its design. Located on the coin’s obverse this lenticular feature will display either “AG” or “999” depending on the angle at which you view the coin. STRICT LIMITED EDITION – Just 15,000 of these magnificent 2018 South Korea Chiwoo Cheonwang Two-Ounce Silver Incuse Medals were struck at KOMSCO, the official mint of South Korea. With its limited mintage, new annual designs and silver purity, South Korea’s Chiwoo Cheonwang series is a runaway hit with both coin collectors and silver stackers. 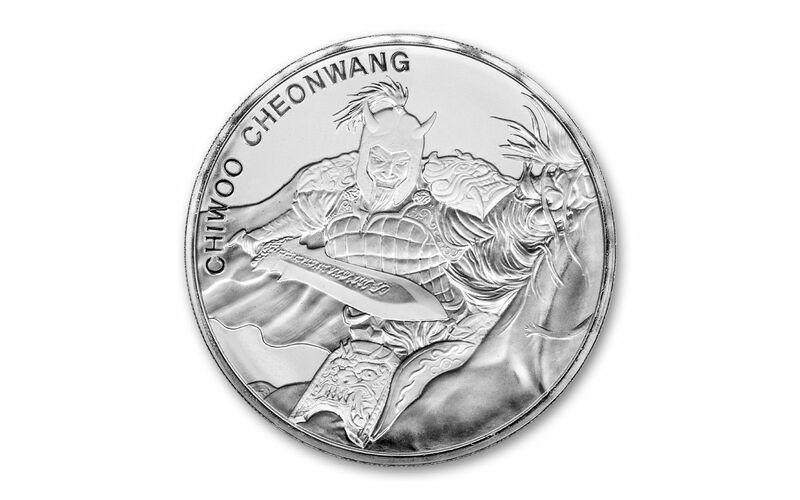 Get your 2018 Chiwoo Cheonwang Two-Ounce Silver Medal today before they’re all gone!